My Irish grandmother told us that if there is a blue sky bigger than a man’s pants, the sun will come out. After I grazed a nettle bush and was tortured for hours by it’s sting, Joe, owner of The Man of Aran Cottages, said they had a saying, “Don’t put your fist around nettles.” The next day, he couldn’t quite remember if that was the actual phrase. I’m not sure about Nana’s prediction although I will steer clear of nettle bushes. And I’m no closer to any of the “lore” I was seeking, but one bit of information direct from Maura does seems right. She claimed that when she went to church, she could tell by the “jumper” a person was wearing who it was before she even turned around. And she added that the same holds true for stone walls. Each family has its own patterns when they knit and when they build a wall. The room seems to be exactly as Synge described: the warmth of the peat fire, a stool next to it, the red petticoat worn by the women of Inishmaan hanging on a hook. His room, on the left of the central room, was large and more austere. On the right side in the smallest room, the couple slept. Magic followed me on another remarkable walk home, again, from Ti Joe Watty’s, That evening, I was on the low road a bit earlier, closer to eight. The light wasn’t as dramatic but just as beautiful. 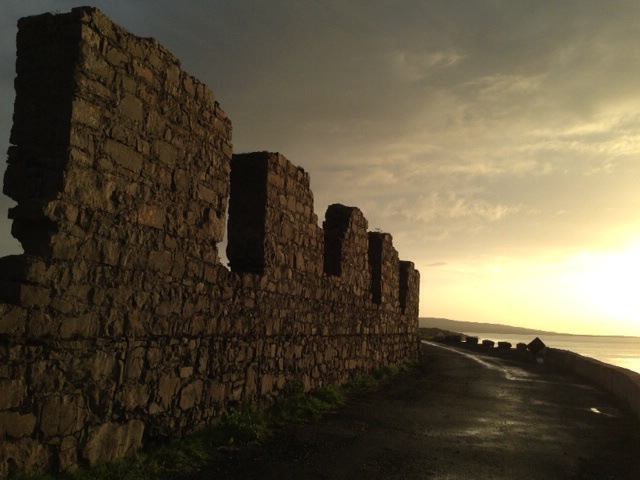 The soft gold from the setting sun infused the air, the green fields shimmered, and stone walls mirrored the light. Coming across the abandoned kelp factory, the time of the fairies engulfed me making me a believer.